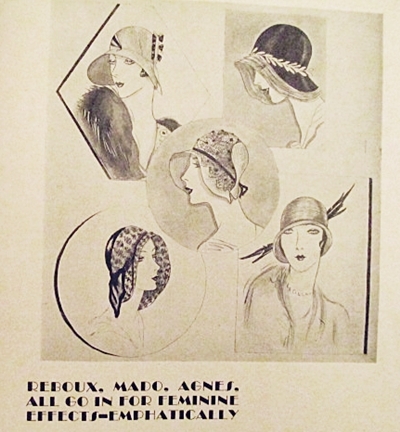 From the February 1930 issue of Illustrated Milliner magazine. 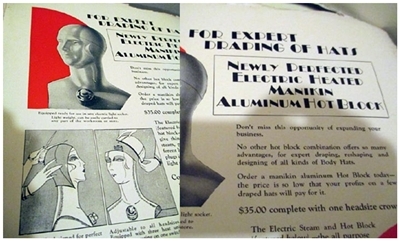 An unusual electric hat form manikin contraption to block hats. 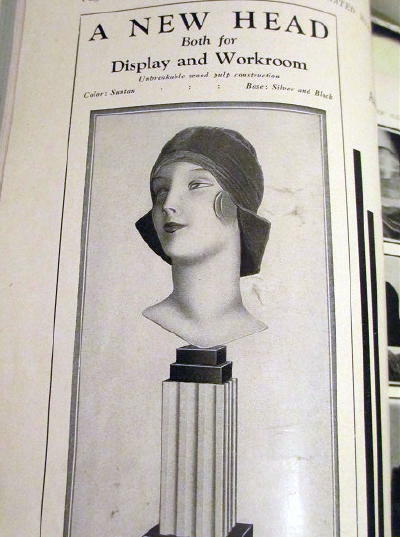 Deco manikin head with fabulous stand. Vintage 1930s designer hats with feminine effects. Posted in Retro Vintage Finds, Vintage Hats and tagged "deco hats", "designer 30s hats", "hat block", "hat styles", "head form", "illustrated milliner", 1930, anothertimevintageapparel, bettebegoodvintage, hats, magazine, manikin, vintage deco. Bookmark the permalink. Vintage Animals and Birds Costume Jewelry. French poodle dogs, owls and horses have been added to my vintage pins and brooches section at Bette Be Good Vintage Jewelry. Posted in Vintage Costume Jewelry and tagged "costume jewelry", "vintage jewelry", 1950, 60s, 70s, animals, bettebegoodvintage, bettebegoodvintagejewelry, birds, brooches, designer, dogs, horse, owls, pins, poodles, puppies, woodland. Bookmark the permalink. Vintage Jewelry. Who Knew I had So Much! 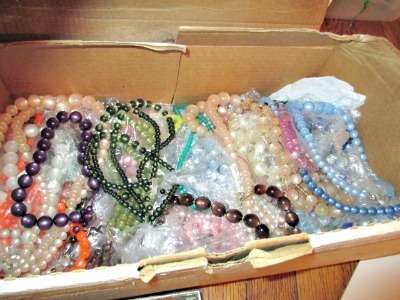 I just spent the day going through boxes and boxes of my vintage jewelry. It was like Christmas seeing all the pretty vintage necklaces, bracelets, earrings and pins that I had packed away in storage. From dainty antique Victorian brooches to 1960s bright Mod jewelry. And where did all those vintage mens cuff links come from? Stay tuned as I will be updating this post when I start to photograph pieces. Posted in Retro Vintage Finds, Vintage Costume Jewelry and tagged "costume jewelry", "vintage jewelry", 1940s, 50s, 60s, antique, bettebegoodvintage, bracelets, colorful, deco, eaarings, jewelry, mod, necklaces, pins, retro, victorian. Bookmark the permalink. 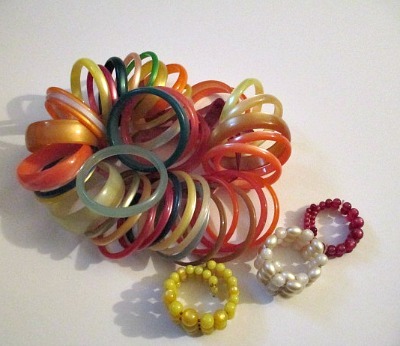 Vintage retro Moonglow lucite jewelry from the 1950s and 1960s has a look all of its own. The vintage lucite beads of the jewelry glow with an inner light. These fabulous necklaces, pins,earrings and bracelets can be found in a variety of bright retro primary colors or pastels. Bright reds,yellows,oranges,blues, greens and purples. Soft pinks,baby blue, moonbeam and other pastels will fit your wardrobe moods and needs. And since the jewelry is made of lucite plastic, they are almost indestructible. I have acquired a huge collection of this fun and fashionable jewelry. Here are just a few pieces. Posted in Vintage Accessories, Vintage Costume Jewelry and tagged "costume jewelry", "retro colors", "vintage jewelry", 1950s, 1960s, accessories, anothertimevintageapparel, bettebegoodvintage, blue, bracelets, chokers, earrings, green, jewelry, lucite, moon glow, moonglow, necklaces, pastels, pink, plastic, primary, red, vintage, yellow. Bookmark the permalink.